The short version Today I leave my day job to pursue a career in sewing education. The End. The medium version Ummm, this didn’t happen overnight. It took over ten years of planning and juggling both jobs until I would make it work well enough to even take the jump. You can check back and see how it’s going or even better click here to sign up for my email list and have my stories sent directly to you. The long version 2005: Realize after 10 years at my job that I have no interest, much less passion, in the generation, transmission or distribution of electricity. This sucked, since I worked for the electric company. I did jobs that had elements of things I liked to do, but it became pretty obvious after a while that I wasn’t going to shine as brightly as or climb as far as I wanted to in this career path. 2006: Reach out to a life coach—Rachelle Disbennett-Lee. Spend 2 months literally crying during our weekly telephone appointments because – how could I follow a passion if I didn’t know what it was? I seriously can’t believe she didn’t refuse to work with me. Pathetic! I knew in my heart of hearts that I loved sewing more than anything, but I really didn’t like sewing for other people and oh how I loathe alterations. Rachelle had me do a lot of exercises that helped me see my true values and how to direct my actions toward them. It was eye-opening. One item on my ‘100 things I want to do’ list (just a great big list of anything that I even remotely thought I might want to do) was play in a band…So, like any responsible adult, I got a guitar, learned to play and write songs and started a band. We called it Dye Hippie Dye and this, my friends, is another story for another day. As much fun as it was, it was never going to help pay my bills, though one night I made $67 for a solo gig, my highest earnings in music to date. I’d have to keep working at a job that just didn’t make me dazzle. Then it happened. 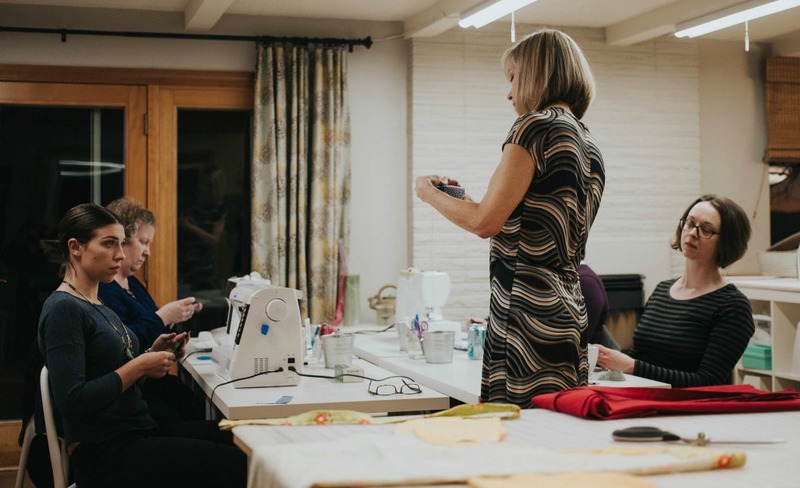 I saw a tiny article in Sew News Magazine about sewing lounges—places to go hang out and sew, or learn to sew, or use equipment you might not have or have the space for in your home. This was IT. I could do this. I could do this part time in my home. It was a real, tangible idea, but that didn’t make it quick or easy. I drove to San Francisco and visited Stitch Lounge and took a couple of classes. I called Maggie Schneider of Sewing Lounge in St. Paul and picked her brain. I started buying and repairing used sewing machines from CraigsList. I read books about teaching sewing or running a sewing business. One such book is called The Business Of Teaching Sewing by Pati Palmer and Marcy Miller. What a great book! Tells you everything you need to do. Period. A google search told me that Pati Palmer lived right across the river in Portland and that Palmer/Pletsch held sewing workshops in Portland, too. Crazy! The first workshop I attended was Fit for Real People, taught by Pati and Marta Alto. It was awesome. I took the teacher training for that course and became a Certified Sewing Instructor (CSI). Now I had cred! Helen Bartley, CSI. Love. 2007: In November I moved house so I would have a space for my sewing lounge. Please don’t think I lived in a puddle of money. I was a single mom with two kids, working a full time job and making it okay, but definitely not raking it in. It was a reach and scary but I knew I had to do it. I had to do it to see if I could. This house had a basement family room with a utility room/half bath and a split entry so sewing customers wouldn’t need to walk through the house to get to the studio. I cobbled together a studio with my used sewing machines and IKEA tables and lamps. Karl with Diversity Design built me a website so I could advertise and sell my classes online. I loaded up the calendar and stared at it and thought…now what? 2008: In May I have my grand opening. My friends come over and we have a fun party. No customers. Then one day, I got an order. It came in my email. 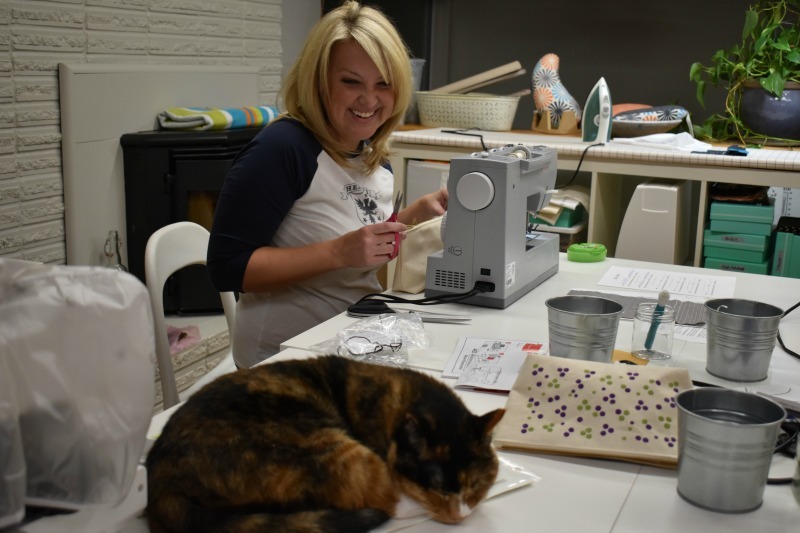 Seam Divas Sewing Lounge-You have a new customer order! Wow. Someone who didn’t even know me paid for a sewing class. Cool. I taught so many ‘classes’ with only one in attendance. Sometimes month-long series’ with only one person. But I looked at it like this: I only had to go downstairs and turn on the lights and I’d be in business. And it beat watching TV. 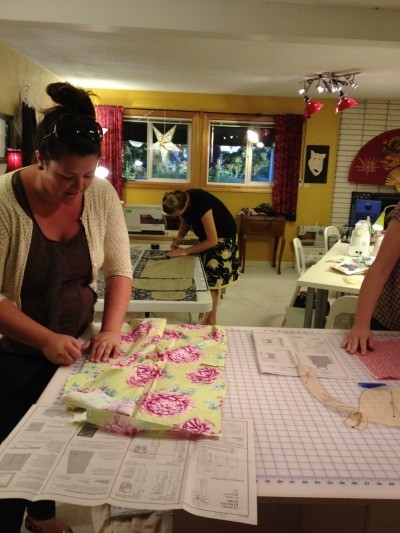 I met some really great people and they got some really great private sewing lessons! 2009-2013: I can’t remember blow-by-blow what happened during these years. I could look it all up, but it isn’t important. What does seem important is that I kept my eye on the ball—kept working on the sewing business and kept planning how to make it into something sustainable. I’d have to look up the date, but during these years I am hired by my sewing icon, Pati Palmer, to assist an eventually teach some of her phenomenal 2 & 4-day sewing workshops. Beyond an honor and frankly the most important work I’ve done in my life, next to raising a couple of very cool kids. 2014: In February 2014 I closed the lounge down temporarily and turned the room into an apartment for my mom. She was 90 and still quite independent but with a couple of small health scares and the fact that she lived across town, we decided sharing the house was a good plan. The remodeling went as most do with elements of greatness and of great frustration. Now, where do I sew? I turned a portion of my garage into a formal sewing/utility room. It is long and narrow with no windows, but heated and has dedicated circuits for irons. I taught private lessons here for a little over a year but really missed the fun (and income!) of group lessons and started to look at the larger garage space. 2015: I uber cleaned and fashioned some climate control for the garage proper and created a classroom that could be set up and taken down in just a few minutes. I could still get two cars parked between classes. It could work. 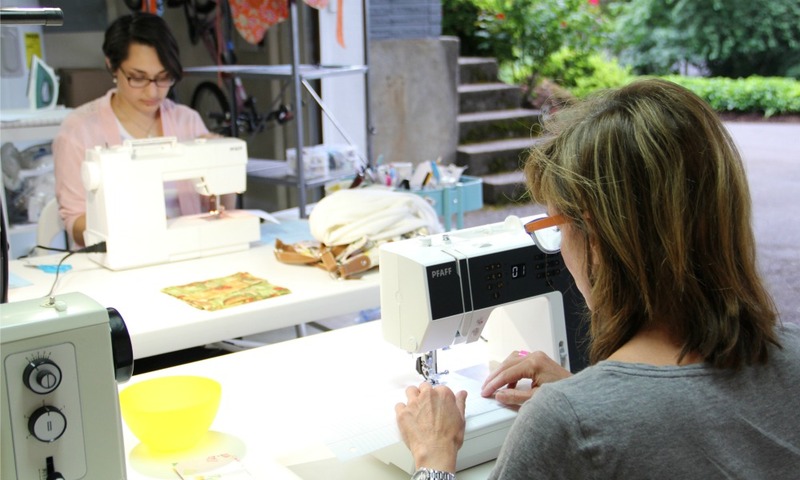 2016: The first classes in the ‘garage’ collapsible sewing classroom were held in June. It worked. During the warm summer evenings it was really special to look out and see the sunset. I have a great view of the Portland lights. The warm breezes could be great for relaxing, not so great for the tossing about of pattern pieces! Ugh. It’s always something. The days grew hotter and I purchased a portable air conditioner for the space, but at 75 pounds it was just too heavy to lug onto the counter to reach the little basement window to vent. Curses! Next I got a window AC unit and…the weather cooled down and I never installed it. Double ugh. AUGUST 31, 2016: Real live red-letter day! On this day I ‘retired’ from my day job to pursue my career in sewing education. This is one of the most exciting jumps I have ever taken. Also one of the scariest. Deets for those who are interested: I can do this because I 1) Got out of debt with the exception of my mortgage which is less than I’d pay for rent, so I kept it. 2) Have a teeny-tiny pension. 3) Have health insurance paid ‘til 65 4) Share expenses with my mom as housemate—folks, this is a big deal. Sometimes you have to MAKE your finances work. I know, DUH, but think about it—how bad to you want to pursue your dream/passion/art, whatever? How much do you loathe a M-F 9-5 gig? Whatever you hate the least, you’ll do, right? I lucked out here because my Mom is cool. 5) With 9 years of teaching in my home under my belt, I had a pretty good idea that I could make enough to survive. Thank goodness I have a huge fabric stash so I don’t have to feel too deprived! 6)I saved up hard so I could weather one or two financial storms okay. I’m sure the experts would say it’s not enough, but OH WELL. 7) If I fail, I’ll get a job. There. Done. I’m out and self-employed. September 2016 to February 2017: I work sort of half-assed at marketing and sewing in general. I teach quite a bit. I develop and teach two new 2-day workshops for Palmer/Pletsch: Fit & Sew Pants and Serger intensive. I struggle some more with my website and learning WordPress. I conquer. March 2017: Can’t stand the garage life anymore, so I moved the sewing lounge up to my living room, and folks, here it resides to this day. I use the bedrooms for an office/photography room and sitting area. It’s an unconventional living arrangement, but I guess that’s me, too. It’s a much more comfortable space and more inspiring as well. So, that brings us back to today. March 19, 2018. I’m getting the room set up for an Open Sew day with some of my very favorite repeat offenders, as I call my return students. We will laugh and sew and and later today I expect that I’ll put my feet up and think to myself, “That was a good day”. It all boils down to the love of sewing, sharing, creating and spending time with others who feel the same way. I love being a sewing teacher and being self-employed. Happy 10th birthday, sewing Lounge. You done me good. I just signed up for my first class and then found this article. I am so glad I did! I was nervous about trying to sew and now I’m more excited than ever!!! What a wonderful story! I know now that I found a great place to learn.